Adalyn is going to be starting school in September. Cue all the tears! I thought about not sending her because I'm going to miss her but of course, that would be very selfish. I know that she is ready and it will be great for her to be around other kids more and learn a ton. She can't wait! She has been asking us to go to school almost everyday since we told her she would be starting soon. ***I'm hosting a giveaway for 2 bottles of Smarty Pants vitamins on Instagram! 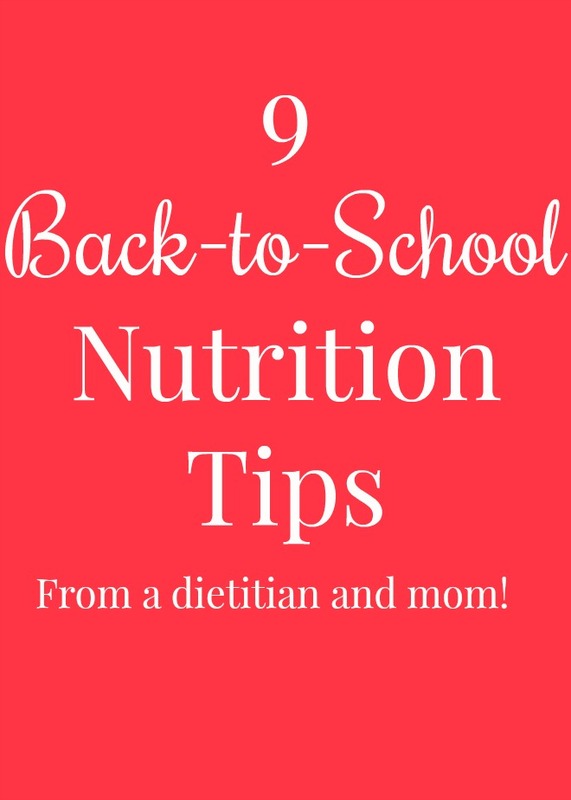 Since we are knee deep in all things back-to-school, I wanted to share some back-to-school nutrition tips for kids. I thought that this may be helpful for parents as they are getting ready for their kids to go back-to-school this fall. Experts say that breakfast is the most important meal of the day! Start your child's day out with a healthy breakfast before school. It can be something quick like a banana with peanut butter, a waffle, egg sandwich, low-sugar, whole-grain cereal with milk, etc. Getting something into those little bellies before school is important for a great start to the day. A smoothie bowl is a fun kid's meal or snack! We recently made the mistake of letting Adalyn have two super sugary drinks plus dessert at a party and regretted it shortly after. She was bouncing off the walls for a bit and then crashed so hard. She was having the worst tantrum and just couldn't shake the post-sugar crash. It wasn't her fault though, it was the extreme amount of sugar that she had. Her little body could not handle it. Limiting sugar (not depriving) is important for kids to feel their best. Now every now and again, I think it is totally fine to have a cupcake, a piece of candy, etc. Having dinner together as a family is so important to me. I know that it might not be possible every single night but at least a few nights a week, try to eat dinner with your kids. I find that when I eat with Adalyn, she eats so much better than if I don't. She also gets excited about the food that we are eating. We talk about cooking, nutrients in the food and many other family topics. Family dinner is so important for kids growing up! In my family growing up, we even ate breakfast together every day! I haven't figured that one out quite yet but we make dinner work each night. It is amazing to see some of the things that kids bring for lunch. I'm not sure how someone could feel their best when they just have a bag of chips for a meal. I pack balanced meals for Adalyn including sliced vegetables, cheese, fruit, some kind of protein and a whole-grain. I'm sure that she won't be eating a 100% balanced meal each day but to feel her best during the day, eating a mostly healthy diet is important. I'm not kidding when I say that Adalyn's favorite part of the day is taking her vitamins. She loves it! Her favorite brand of vitamins are Smarty Pants vitamins. She takes their gummy probiotics and their Kids Complete vitamins. She calls them her purple vitamins and red vitamins. I have to keep them up super high so she doesn't get into them! Smarty Pants just came out with a new flavor of their Kids Complete vitamin: cherry berry. Of course, Adalyn loves it. It is a multivitamin with omega-3 in it which I like as a mom and dietitian because I think it is important to get plenty of omega-3. I always explain what vitamins are for how different vitamins can help us be our healthiest. These gummies have no synthetic colors, artificial sweeteners, flavors or preservatives. They are gluten-free and contain no high fructose corn syrup. When I was in school, I remember being hungry when I got home every day. I'm sure that Adalyn will be the same because she asks for snacks all day long anyways. Some healthy snacks that we do are veggies with hummus, popcorn, fresh fruit "ice creams"- just frozen fruit blended with a little milk, peanut butter and jelly waffle sandwiches, etc. Even if your child brings their lunch, they can still buy their milk at school. It typically is not very expensive and is a great source of calcium and protein. Plus, if they are drinking milk, they are most likely not drinking another less healthy beverage. Teaching Adalyn about gardening on a vacation. At school, your child will come across all kinds of new things that they haven't seen before. They will be exposed to kids who only eat a jelly sandwich everyday or kids that have frozen pizza bites everyday. Teach your kids about good habits at home so that they know why they should eat healthy most of the time. I never want Adalyn to feel deprived of anything. She can eat any kind of junk out there but I want her to understand moderation and why we need nutritious foods. Look mom! Fresh picked strawberries! When I became a parent, I had to learn to relax a little bit when it came to nutrition. Sometimes, when Adalyn goes to other people's houses, they are going to give her foods that I may not have chosen myself. That is okay! I cannot be a helicopter parent. It is okay for kids to skip their vegetables some days and then make up for it other days. You cannot control what kids eat all the time. You can offer them healthy choices and teach them about nutrition and hope for the best. Do you have any back-to-school nutrition tips to share? I would love to hear! Disclosure: This post is sponsored by Smarty Pants. All opinions are my own.